I checked out of the Westin Snowmass mid-morning as the snow continued to fall and drove the few miles over to my home for the next week, The Crestwood. 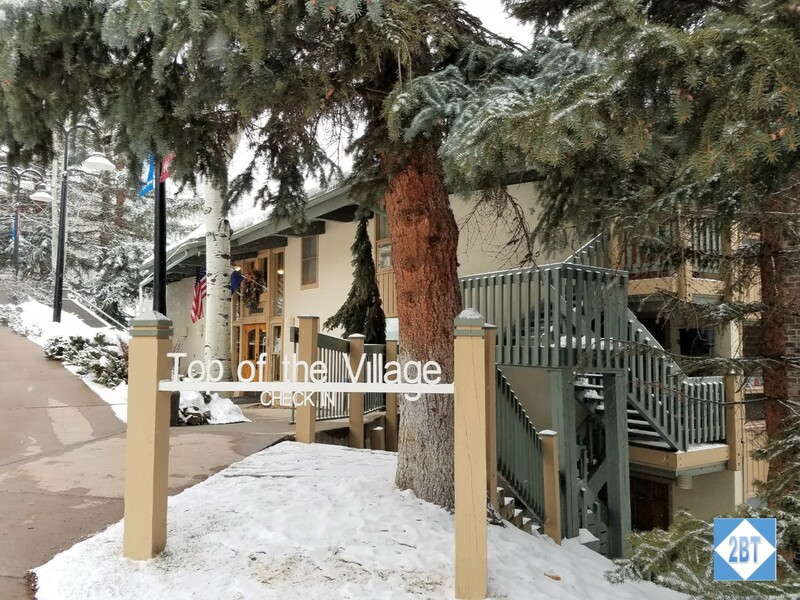 While there are a few more properties higher up the mountain on the same road, this road is not one of the ones in Snowmass Village that is heated so you’ll want to be sure your vehicle is properly equipped if you plan to drive here in the winter. The Crestwood parking lot is heated, however, and while it was having trouble keeping the parking lot snow-free, it was doing the best it could. The Crestwood has several shuttle vans that will take you wherever you need to go within Snowmass Village. The Village Shuttle, the free bus system for Snowmass, actually has a stop on The Crestwood’s property and there’s even a small indoor waiting area, which is terrific. The front desk is in a centrally-located building. Walking through the front desk area and out the back door you’ll find the heated pool and two hot tubs. Downstairs is the small gym and a massage room. More about those later. I had to wait a little to check in. The snow was still coming down and a number of flights out of the Aspen Airport (ASE) had been cancelled, stranding people overnight so there were folks who’d stayed here last night trying to find a place for another night or two. I wasn’t bothered about a slight wait as I knew there was a good chance my condo wouldn’t be ready anyway and that turned out to be the case. Since I still had no luggage I was just able to leave my carry-on behind the desk and catch a ride in the shuttle over to the Mountain Mall (basically right where I’d been at the Westin!). The Tylenol, breakfast and cool air had really helped to alleviate my headache and I stopped by one of the ski shops to put a pair of demo skis on hold for the next day as I was anticipating my luggage arriving later that day. By now I was getting hungry so I enjoyed a leisurely lunch. The restaurant I selected was fairly quiet as so many folks were out enjoying what was shaping up to be the largest single snowfall of the season so far.